Originally featured in the Omaha World-Herald on September 13, 2014. Early city records show that Elkhorn had a library for one year in 1874. It contained 30 bound books and 200 dime novels borrowed for a fee of 10 cents per week. No further mention of the library was recorded until 1925 when Elkhorn opened a library at 110 Main St., thanks to the fundraising efforts of the area’s Pythian Sisters and a book donation from Omaha Public Library. In 1936, the Elkhorn Women’s Club assumed responsibility for the library and it was moved to a room in the town hall. The library was relocated 30 years later to the newly constructed Elkhorn Community Building at 401 Glenn St. and it became an official city department. By 1983, the library was moved downstairs in the same building to make room for more materials and visitors. Continued growth prompted Elkhorn city leaders and Elkhorn Public Library Foundation members to think about the library’s future. The city considered remodeling the space the library currently occupied, but library director Wendy Anderson believed that the community would outgrow even a newly renovated space within 10 years. The City Council agreed with Anderson, and in 1992, council members voted to build a new library. The question that followed proved most challenging. Where would the new library be located? Initially, the most desirable location was directly across the street from the existing library on a parcel of land owned by the Elkhorn Public School District. This proposal met some resistance from school board members and was ultimately dismissed. A location was finally settled upon in 1995, when the family of Lois Johnson Hayes and Harvey Hayes donated seven acres in the name of Roy and Bess Johnson. The new library would be named the Bess Johnson Elkhorn Public Library after the former teacher, 4-H leader and library board member. 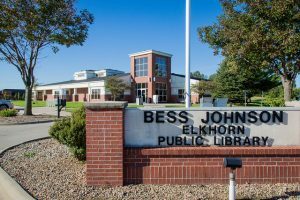 The highly anticipated Bess Johnson Elkhorn Public Library, at 2100 Reading Plaza, opened with a dedication ceremony and open house in June 1996. Visitors were welcomed with a quilt hanging in the library’s foyer designed and assembled by the Elkhorn Women’s Club. “Quilted Library” features a bookcase full of books and artifacts and acknowledges library supporters. The community heirloom serves as a symbol of Elkhorn residents’ resolve to build and maintain a community-based library system. When Elkhorn was annexed by Omaha in 2007, the library became the 11th location in the Omaha Public Library system.